Galia Orme of Choc Chick Kits was introduced to me through a mutual friend. I tried her initial kit which had the same lovely ingredients but with agave syrup and I just couldn’t make it work for me. I kept in touch and to my delight and pleasure she switched sweeteners from agave to fruit sugar. 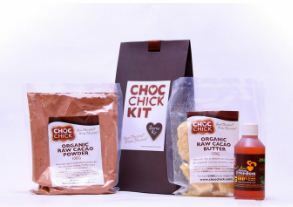 Now, the thing you *need* to know about Choc Chick Kits is that this is all about making healthier chocolate yourself. No artificial anything in this chocolate – just the goodness you put in. What also makes this the perfect kit is that everything bar the mould in there and since the mould can be a takeaway dish it gave me the perfect excuse to order another byriani from my local. The chocolate is really easy to make. As with all chocolate, you do have to have a pot of water simmering and a mixing bowl but these are in almost every kitchen (well, perhaps not the actual simmering water – I’m guessing that isn’t in every kitchen to hand all the time). You break the cocoa butter up a bit, add the right amount of powder and fruit syrup and mix and melt. Then once it has combined, simply pour it in an ice cube tray (not recommended by me who struggled to get them out) or a tub of some kind (*Tip* line with cling film to help with extraction) and voila! You have made your own raw chocolate. Galia makes it better than I ever could. This is raw chocolate and so not a personal favourite but I do appreciate the way you can do anything you want with it. I think the fact you can make truffles and bars and whatnot will appeal greatly to families and anyone trying to remove all the bad stuff from their diets. ***FREEBIE FRIDAY*** Thanks to the lovely Galia from Choc Chick I’m giving away one Chock Chick Starter Kit! Just leave a comment here and/or on Facebook letting me know what you’d add to your raw chocolate bar and/or tweet “I’d love to bag this great Choc Chick Kit from @mostlyaboutchoc and @goChocChick http://bit.ly/eEBgP7” & I’ll choose the winner Sunday. +++ WINNER+++ Kavey wins the Choc Chick Kit! Though it would rather ruin the healthy nture of the chocolate, I’d add a dash of Rum and try to see what Choc Chick Kit Rum Truffles would turn out like! I’d add turkish delight and pistachios for an eastern twist to my melt in the mouth chocolate!! Sour cherries or fresh raspberries. Yum yum yum! Definitely a splash of Baileys! I would add honey roasted cashew nuts and would top with edible translucent glitter! Chilli and cinnamon. Hot, hot, hot with a touch of spice. Cinnamon it would have to be. It’s festive and I love it. Great giveaway. I’d add some honeycomb…maybe some brazil nuts too. I tried a combination once, which was fresh coriander nad chocolate, I loved it. I’d like to combine fresh coriander and fresh mint together. I’d do some homemade honeycomb – I’ve been waiting for an excuse to give it a try! Looks so much fun and so does this kit!